Remember, We do this to have fun!! Then there is California diving at its most ridiculous, Greyhound Rock. Santa Cruz County sits on the north side of Monterey Bay, opposite of Monterey. In contrast to the granite of Monterey and Big Sur, the Santa Cruz area is mud stone... and so is the visibility. If you look at the area on a map, you will notice that the coast, as it extends west from the city of Santa Cruz, aims due south. Those waves can come from a long ways away. The water is cold, often up and down from 50 degrees. It is a nasty place to dive, but it is also pristine, challenging, lush and beautiful. I spent a number of years diving that area and saw many things. Some days were bad, some days were... better. This tells some of what I did and saw there during the 70's and 80's. It also tells why I quit diving Greyhound Rock. About 20 miles up Highway 1 from Santa Cruz is Greyhound Rock Fishing Access. It is about 5 miles south of Ano Neuvo Island State Park, where the elephant seals haul out to breed. That is quite a place by itself. At Greyhound, there is a parking lot and a paved trail down to the large beach cove at the bottom of the cliff. Years ago, this trail was a road and I have seen it driven on, but only by the hardy. It is a beautiful view from the top of the cliff down to the cove. It is a nasty walk. That trail is steep and long... and slippery when wet. The main reason for a diver to go there is basically for the abalone. This place is not greatly visited. The whole huge beach cove may be completely empty. It is unlikely that there will be more than a dozen people at most. 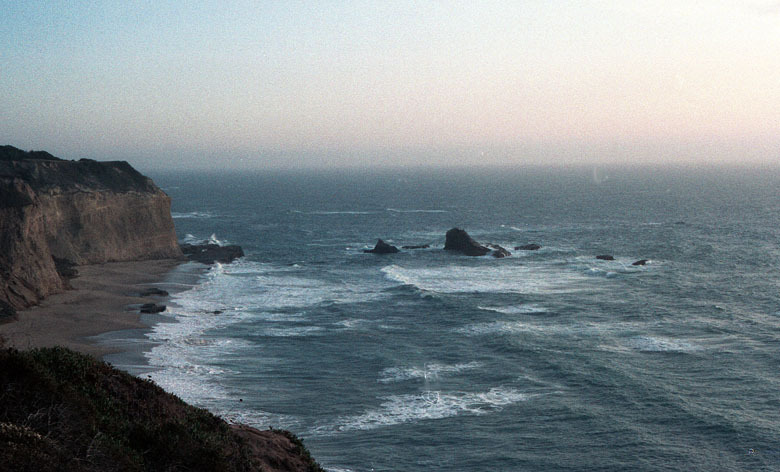 It has the finest natural windswept beauty of the California Coast. This is wide open diving area. Do you believe me when I say that it is a big cove with a challenging cliff? Dan and I were walking down the trail once and we could see an elephant seal laying on the beach. We could not tell if it was alive or dead. It was right where I wanted to enter the water. It is a few hundred yards down the trail and over the beach. We kept wondering if it was live or dead. As we got about 50 yards away, the answer was given quite clearly, by the sort of a shrug that the animal gave. Now this was a mature sea elephant bull. He is huge. I told Dan not to let him off of the beach while I was swimming. Of course he came by and buzzed me when I was out in the water. Now the next jolly thing about Greyhound is the waves. Ever seen the beach break, across the bay at Monastery Beach in Carmel. Now those are waves to rattle your teeth. Big waves that break suddenly, right on shore. Well that is the way it is here. I rate them both as the nastiest waves in California. At the bottom of the trail, the west side of the bay is a rock or spit that juts out into the water like a finger for about 100 yards. Just past even with the end of this and about 30 yards into the cove, are the rocks where the good free diving for abalone starts. The diving extends for hundreds of yards across the cove and beyond. It is really good diving there, but it's pretty exposed. This is north of Monterey, so no abs could be taken on scuba then and it is south of the Golden Gate, so no abs can be taken now at all. This older picture(s) shows the cove (minus a lot of the middle) on a calmer day, with Summer sand buildup. It was rarely this calm. I usually started my dive by swimming from the beach to a bit outside of that last rock in front of the 'finger'. The current is visible about 40 yards past the 'finger'. Realize that when diving here anytime, especially in Spring, this is a prime place for sleeper waves. At times that rock off the 'finger' is a prime surf zone for 5 to 7 foot waves. Surface carefully. Still it is acres and acres of lush diving pretty much all the way from Santa Cruz To San Francisco. There is another cute feature of this spot. This is the place of the landlords. You know, whitey... and he has been known to show up for lunch. With the rise in the seal population, there has been a great increase in the white shark population. This area is one of the few areas where I have ever concerned myself with this hazard. In these days it is something to think about. In the 70's and 80's, when I did most of my diving in this area, it was not so bad. Ano Neuvo has always been a chancy place and we did have an attack one day when I was at Pidgin Point. You have to look for seals. If they are panicked, they may have seen something. Also, try to stay in shallow water. Really, going into deeper water anywhere north of Monterey presents a shark risk... I ignore sharks, because I do not like how they taste. Another special thrill that this dive spot offers is that you are diving on the rocks in the mouth of the cove. Well, if a really big wave comes, it is going to break right on you. It is something to come up from a free dive and see this huge breaker dropping down right on you. While it is a place to find abalone, you never know what you will encounter. It is rather open to the ocean. You see lots of crabs, sponges and other various invertebrates. There are not that many large urchins and there are some of the big green anemones. You can see some nice rockfish and there were always some flat fish in the sand channels. It's not about just grabbing some abalone. That is fairly easy if you are skilled. The fun is savoring the diving and searching for what beauty and surprises are hidden in the reef. The poor visibility offers some challenges. You have to be careful not to run into things, especially the bottom, when you are free diving. This is where I learned to hold my iron so that it could slip through my hand if I hit the bottom without seeing it. You are moving fairly fast when free diving. If you don't see it, you can hit the bottom pretty hard. The lack of vis also leads to a chance for a special thrill. Everything you encounter appears suddenly and unexpectedly. Nothing gives a thrill like moving up a rock and bumping your mask into the head of a big Ling Cod! Just to note. The vis here was generally better than at Pidgin Point. You sometimes got 6 feet of real visibility if it is sunny. What more could you ask for? I've been there for less than a foot. The predominant bottom growth in the shallow waters consists of red coralline algae and small laminareas. All through the area and especially in the deeper water are Bull Kelp. With each wave, they bob under the swell, then back a foot or so above the water. These are held onto the bottom by stalks that are similar in size to a 7/16 inch rope. This allows them to anchor themselves in very deep, rough water and still get most of their "leaves" on the surface, in the sun. There were some of these plants all through the area, but in a number of places, a bit off shore there are "groves", often 75 yards across, that presumably mark an offshore rocky reef that is not too deep. It would take a boat to get to most of these patches. Given what I know about the area I would expect them to be some exotic diving, I never did get to dive them. Well, the dive is over and you have found 4 or 5 nice big fat red abalone, depending on the limit when you were hunting. You have to swim back and pass through the nasty surf zone. Then you have to schlep your game and your gear up that trail again. Did I mention that the trail is extremely steep? So why did I quit diving there and go on up to Pidgin Point? It is a huge beautiful dive area. Was it the beach break, the ocean waves, the hike, the sharks, the elephant seals or the lack of visibility? It was none of those. Actually, while you are out diving and keeping an eye on the waves coming in, you will notice a funny water movement about 30 yards beyond the reef, just past where the waves break. It almost looks like... well what? I finally concluded that it was a current, going past towards Monterey Bay. Now if you get out there, you are in trouble plenty. It finally encouraged me to find other sites. I was able to regularly get a limit of fat 9 inch abalone at Greyhound. That was pretty extraordinary, though I took it for granted then. This was when Dan and I would have abalone cooking competition and try to eat a whole one of these, each. Greyhound Rock was an interesting place for me. It was where I did my Journeyman diving after my apprenticeship in the friendlier waters of Malibu and the Channel Islands. As some have said, once you dive the San Mateo Coast, you can dive anywhere comfortably. It is simply to rough and difficult for most divers to visit. I rarely saw other divers there at all. For me it wa a wealth of diving that offered me all I wanted, hunting, lush diving and a challenge.